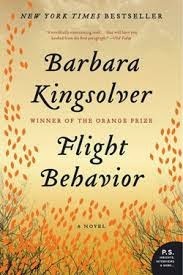 At the end of Flight Behavior by Barbara Kingsolver, Dellarobia, and her 6 year old son, Preston, leave the house to walk to the neighbor's peach orchard where the butterflies have descended off the mountain roost temporarily in the cold snowy weather. It is early in the morning when Preston is waiting for the school bus to take him to his kindergarten and Dellarobia has decided this is the time to tell Preston that she and Cub are separating and that they will be moving to an apartment. "Why did you and Dad bet married by accident?" he asked. "People do wrong things all the time, Preston. Grown-ups. You're going to find that out. You will be amazed. There's some kind of juice in our brains that makes us only care about what's right in front of us right this minute. Even if we know something different will happen later and we should think about that too. Our brains trick us. They say: Fight this thing right now, or run away from it. Tomorrow doesn't matter, dude." He stopped strumming his knee, and appeared to think this over. "If I could teach you one thing, Preston, that's it. Think about what's coming at you later. But see, all parents say that to all kids. We don't follow our own advice." He sat perfectly still, staring at snow. "You know what else? Grown-ups will never admit what I just told you. They'll basically poop their own beds without saying they made a mistake. even the ones that think they are A-number-one good citizens. They'll lie there saying, 'Hey, I didn't make this mess, somebody else pooped this bed.'" The tiniest of smiles pulled his mouth out of line, like a snag in a stocking. When we finish Flight Behavior we can ask, "And what is the moral of the story? What is the lesson to learn from this novel? What meaning did you make of the story?" First, Barbara Kingsolver is a gifted writer. I have loved all her books, both fiction and non-fiction. Flight Behavior grapples with difficult subjects: climate change, stagnating marriages, fears for the future for children we desperately love, the role of science in society, the role of ethics in society, the dynamics of extended family life, cultural differences of region and class. infidelity, the importance of friendship, and the role of religion in our contemporary society. Whew! This is not a beach read but a novel of substance, depth, elegance, grace, and challenge. Second, Flight Behavior deals with the most significant and challenging topic of our contemporary times, climate change which will affect all of us on the planet in very significant ways over the coming decades and centuries. The science is not debatable at this point, 99% of scientists agree with it, climate change is happening at a rapid rate and it is human induced. Those with vested interests want to argue because they don't want their profits threatened, or their life style disrupted, their political power, or some other vested interest disturbed. Third, the major moral of the story is one of hope, that humans grow, can become more aware, that they can adjust and respond positively to what some might experience as negative changes. While Dellarobia is concerned for her children's future she is confident that Preston will grow up into a good man, and Cordie into a good woman, who will benefit humankind and life on the planet. What Dellarobia, herself, will do with the next stage of her life is unclear, but she is bright, capable, earnest, and with a sense of purpose has given up her adolescent sexual acting out in service of being true to herself and her desire to be of service to the other creatures on the planet. Fourth, the lesson of the story is that we, as humans, need to grow-up and take responsibility for ourselves and our environment. Some of us have grown-up, some of us like Dellarobia are in process, and some of us need to get with the program if we are to salvage some semblance of civilization on the planet. 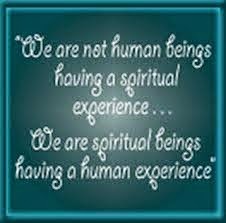 It is time to give up childish things, and thinking, and behavior. As St. Paul wrote in his first letter to the Corinthians, chapter 13, verse 11, "When I was a child, I talked like a child, I thought like a child, I reasoned like a child. When I became a man, I put the ways of childhood behind me." What does it take to grow-up and put away the things of a child? Education, instruction, guidance, and accountability. Who will provide it? Religion for our modern age. Just one religion or a particular one? It will take them all, working together in an interreligious collaboration, to save ourselves, each other, and as much life as we can on this planet in its multitudinous diversity. 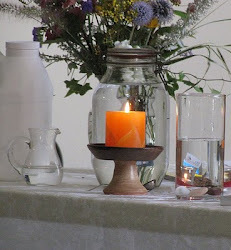 For me Unitarian Universalism works best with its seven principles and its Christian history with a little Buddhism and humanism thrown in with some Wiccan and Native Spirituality, and Sufism, and Hindu stuff. In short, my God is too big for any one religion. The teaching of Flight Behavior is that we humans can't screw with Mother Nature arrogantly without suffering her displeasure. Thank you for the wonder discussions this month of Flight Behavior. It is a remarkable book and one that should be taught in colleges for sure if you know what I mean. The articles here on the novel have been very interesting and I have appreciated them a great deal.